My approach is connecting leaders and organizations to what is important and relevant, knowing that when leaders align this with their actual core skill sets, it activates the desire to perform, not based on getting gold stars, but on the pure pleasure of living into their fullest potential as leaders. I believe there is a certain kind of cultural narrative, that efforting is a way to squeeze more work from us. I have no desire to turn you into a harder worker. I have a desire to connect you to your innate abilities and the internal source of inspiration and drive so that work becomes more fluid and easy for you. My primary benefit is to those who have elevated themselves to a place where they have successfully negotiated their field and are wanting to cultivate their capacities while bringing back energy, new inspiration and meaning into the next stage of their business development. With experience drawn from over 20 years as an executive in technology, retail and life science industries, and as a certified leadership coach and organizational development strategist, our clients state their appreciation of a multi-dimensional approach that integrates a strong foundation in science, psychology, mind/body leadership practices with a shared experience as an accomplished business leader. Working with leaders in all industries: Life Science, Retail, Hospitality, Technology. Leadership & Executive coaching: My primary benefit is to those who have elevated themselves to a place where they have successfully negotiated their field and are now committed to uncovering blindspots, and bringing back energy, inspiration and meaning into the next stage of their business development. Strategy & shaping organizations in which we long to participate: We align with you and your leadership teams, not offering off the shelf solutions, but real partnership that unlocks the potential of leaders, teams and organizations. We work to efficiently and expertly assess the capabilities, gaps and opportunities in your company, designing strategies and creating work environments that engender trust and that celebrate individual and teams' contribution and impact. Generative Coaching: We get to the heart of unconscious and neurotic strategies that feed the ego and access generative states to transform them. This helps clients to transform problems rather than just sort them, and to move on to new, previously unimagined levels of creativity in both their personal and professional lives. “As woman and business leader, it was both powerful and necessary to have a coach who would was not timid about providing me with honest observation and insight, but also someone whose experience and competence I could trust. Susan is that coach!" 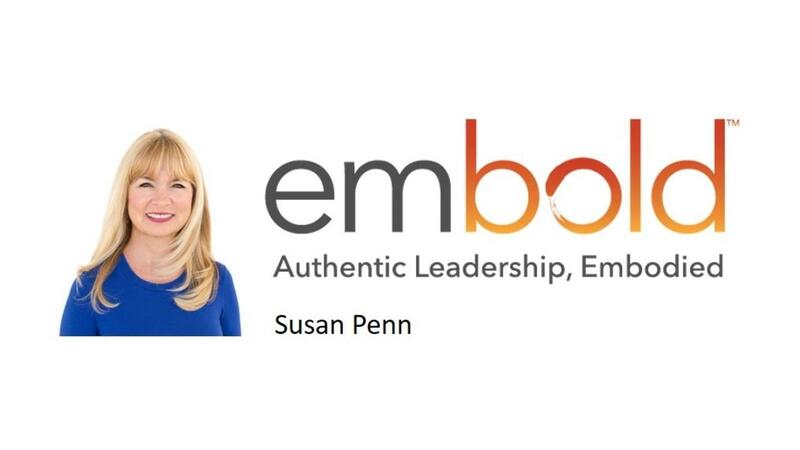 "I’ve been working with Susan Penn and Embold for the last few years and she has helped me unleash my potential, grow my emotional intelligence, and talk me down with openness and compassion after working with some extremely challenging executives! She is a joy to work with and I would highly recommend her to anyone for executive coaching." "Susan's deep understanding, experience and desire for creating and building healthy cultures, developing leaders and reframing change as opportunity for growth will profoundly impact any leader or company fortunate to collaborate her. They do not come better than this!" "I began working with Susan with only an idea of what the work might mean for me. The sessions with Susan have been nothing short of transformative, and I am experiencing a new connection between my mind and my body, and seeing a real difference in the way I move in the world. Really wonderful stuff!" “My organization gave me a choice of coaches to utilize for my further development. When I met with Susan, I was amazed at how quickly she got to and clarified the core issue and helped focus me in the right direction. She supported me in changing how I was interacting with others, changing behaviors which, in all likelihood, were affecting my ability to receive a long-promised promotion. My work with Susan not only increased my awareness of how others perceive me, but helped me to show up as a better leader. "